As we head toward the autumn evenings, we have some exciting shows on their way to us this season, which will be the perfect antidote to those chilly winter evenings! So all aboard the Fish and Actors Train as it’s full steam ahead to an Autumn Season packed full of delights to please everyone! The Season starts off with a variety of music events, starting with This is Music Hall – The Best of British Variety,( Wednesday 23 July) bringing traditional variety performance back to the Civic in a celebration of the best of British variety. Fans of Frankie Valli & The Four Seasons should look out for Let’s Hang on which will be Working their way back to us on Thursdayrsday 24 July. The charming tale of Angelina Ballerina – The Mousical (Friday 25 – Sunday 27 July) will be pirouetting onto the stage in this sparkling musical packed full of singing and dancing! Join Angelina and her Fridayends at the Camembert Academy as they prepare for their performance of ‘Dancing with Mice’. The ever popular Last Night of The Proms returns to the Civic this year in a Last Night of The Proms Special to Commemorate the 100th Anniversary of World War One and the 75th Anniversary of World War 2 (Monday 28 July); join The British Philharmonic Orchestra for an evening of reflection, rousing tunes, flag waving and of course the usual Pomp and Circumstance! The Bohemians return to the Civic this year with The Bohemians – A Night of Queen as It Began Tour (Thursday 31 July), this internationally renowned Queen tribute band bring their new tour taking you back to the early ‘70s and through to the Magic of ’86. Featuring a cast comprising of past principal performers from the West End, this special performance of Beyond the Barricade (Friday 5 September) is celebrating 15 years and in this anniversary production looks back through the years and includes many of the musicals that have made it the UK’s leading concert of its kind. Billy Mitchell and Ray Laidlaw will be bringing The Lindisfarne Story (Saturday 6 September) an evening of celebration of the music and achievements of Tyneside’s best loved band, told through Acoustic versions of Lindisfarne’s classic songs and tells the inside story of the group’s rise to fame from beginnings in Whitley Bay to San Francisco Bay! Darlington Dance Festival (Monday 8 September) bursts onto stage for an energetic evening presented by dance schools and community groups in a vibrant celebration of dance in Darlington. The first of our week long performances of the season is the moving production of Private Peaceful (Tuesday 9 – Saturday 13 September) commemorating the 100 year anniversary of World War One. Winner of the Blue Peter book of the year, Private Peaceful is by third Children’s Laureate Michael Morpurgo who is the award winning author of War Horse and similarly this production will also appeal to adults and family audiences alike. This show is suitable for everyone aged 8and above. Have you been wondering what happened to ‘Bobby & Laura’ and ‘Norman & Sue’? Dreamboats and Miniskirts (Monday 15 – Saturday 20 September) Twists and Shouts its way into Darlington as we catch up with the characters we have come to know in Dreamboats and Petticoats as we follow up on their lives in the swinging 60s. Packed full of music that is guaranteed to get you dancing in the aisles. 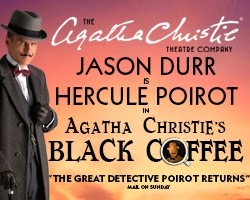 The great detective Poirot returns in Agatha Christie’s Black Coffee (Monday 22 – Saturday 27 September), starring Jason Durr (Heartbeat, Lewis, Midsomer Murders, Miss Marple), Gary Mavers (Peak Practice), Ben Nealon (Soldier Soldier), Deborah Grant (Not going Out, Peak Practice, Bergerac), Oliver Mellor (Coronation Street) and Georgina Leonidas (Harry Potter). In an isolated house on the cliffs of north Cornwall the sibling rivalry between identical twins Max and Ashley Henessey is coming to a murderous climax! Double Death (Monday 29 – Wednesday 1 October), starring Brian Capron (Grange Hill, Full House, Where the Heart is, Coronation Street) Andrew Paul (The Bill, Where the Heart is) Kim Tiddy (The Bill, Hollyoaks) and Judy Buxton (General Hospital, On the Up). A ticket will entitle you to a whole seat however you’ll only need the edge of it. Next up in October is this thought provoking, thrilling, witty performance of The Man Jesus (Thursday 2 October), starring Simon Callow, one of Britain’s best loved actors, performing this fresh and moving account of biblical stories. His powerful portrayal of the tyrants, traitors and madmen and in Jesus’ life asks people of all faiths and none: what sort of a man was able to inspire the history of the world? An audience with Tim Brooke- Taylor (Friday 3 October) will take place at Central Hall. Best known as one third of the comedy trio The Goodies, Tim has been delighting audiences with his gentle, zany humour ever since joining the famous Cambridge Footlights back in the early 1960s. Tim will be joined in conversation with broadcaster Chris Serle, best known for his work as a reporter on That’s Life. Over the Rainbow – The Eva Cassidy Story (Friday 3 & Saturday 4 October) stars Bad Girls and Emmerdale actress Nicole Faraday. The production pays a genuine and heartfelt tribute to a true artist who was not interested in fame and fortune but wanted nothing more than to create beautiful music. A talented world-class cast of actors and musicians recreate her original arrangements and recordings which have received accolades from Mick Fleetwood, Sting ,Nora Jones, Katie Melua and Chris DeBurgh. Of all the stars in folk music’s wondrous firmament few shine as brightly as Yorkshire’s Kate Rusby (Tuesday 7 October). A remarkable interpretative singer Kate’s soulful vocals, Kate will be joined on stage by the cream of British folk musicians who form her band. These virtuoso artists are sure to delight you with their exceptional talents. One man to do it all. One man to rule them all! One Man Lord of the Rings (Wednesday 8 October). The extremely talented Canadian actor Charles Ross will stun you with his one man show where he recreates the enchanting world of Middle Earth with nothing more than elbow pads and his outrageous imagination. The Ken Dodd Happiness Show (Thursday 9 & Friday 10 October) Come and enjoy the famous Happiness Show and enjoy a tattifelarius (that’s Knotty Ash for fun- filled) evening of laughter and songs presented by a true comedy genius! Theatre Hullabaloo present Angel (Friday 10 October) at Central Hall, a story of Bill (who is a girl by the way) who returns an old woman’s shopping bag on an afternoon when she had nothing better to do, and finds her life is never the same again. A brilliantly funny and heartwarming new play about childhood and ageing. Recommended age for this show is 10+. October continues with the hilarious and moving tale of Stones in his Pockets (Saturday 11 October). This multi award winning comedy has been seen by over 2 million people; don’t miss out on this tale of how a quiet Irish community is turned upside down by the arrival of a Hollywoodmovie shoot. Starring Shobna Gulati (Coronation Street, Dinnerladies)and Joe McGann (Calendar Girls, Upper Hand, The Hanging Gate) John Godber’s April in Paris (Tuesdayday 14 – Saturday 18 October) will make your heart melt. Join Al and Bet in this hilarious romantic adventure, Olivier –nominated for comedy of the year when it premiered and featuring John Godber’s unique brand of observational comedy. It will be ‘Fabulous Baby!’, taking us through to the end of October we have the ‘Gloriously Funny’ Sister Act The Musical (Wednesday 22 October – Saturday 1 November)– presented by DarlingtonOS our resident amateur operatic group, Sister Act is a hilarious musical comedy with larger than life characters, a set of nuns who find their voices and a diva who finally finds true Friendship. Playing at Central Hall, the delightful and enchanting family show Handmade Tales (Thursday 23 October) takes place as part of the Take Off festival. Handmade Tales is brimming with five original children’s stories and live music, exploring a land of lost things, magical kingdoms, supernatural dictionaries and a whole lot more! This is a family show which will suit the youngsters aged 6 – 11 . Calling all Junior Detectives aged over 6….Me and My Cat? (Monday 27 October) taking place at Central Hall is a hilarious adventure full of manga clues and mysterious events. Will Detective K solve the mystery in time? Using projection, puppets and bags of ingenuity, this is a fast- paced, action- packed story and oodles of fun! November starts off with the affectionate, moving and fantastically funny homage to the greatest comedy double act that Britain has ever seen! Eric and Little Ern (Monday 3 November) vividly brings back warm memories of a bygone era. Reviving some of the finest moments of Eric and Ernie’s television and stage performances , together they make a brilliant comedy that recreates the all-ages appeal of Morcambe and Wise in their heyday! 5,4,3,2,1…..it’s the Manfreds in concert! ( Tuesdayday 4 November) Boasting some of the finest quality talent ever assembled on one stage since Manfred Mann formed in 1962 they have firmly secured their place in the history books of British popular and RnB music with timeless anthems such as Do Wah Diddy Diddy, 5,4,3,2,1, Mighty Quinn and Pretty Flamingo. What would you do if a Viking moved in next door?..... Horrible Histories are Live on Stage with Barmy Britain (Wednesday 5 – Sunday 9 November), with stunning 3D Bogglevision effects and live action! It’s the horrible history of Britain with the nasty bits left in! Joining us at central Hall Nicholas Crane Maplines (Tuesdayday 11 November) asks, where would we be without maps? Drawing on journeys and film shoots ranging from the Hindu Kush to Tibet and the Pyrnees to the Pennines, join Nicholas Crane as he explores the way maps open the door to geographical enlightenment. Regeneration (Tuesdayday 11 – Saturday 15 November) is the latest production brought to us by the Touring Consortium Theatre Company who brought To Sir With Love and Brassed Off. Regeneration examines the insanity of war with shocking clarity; a powerful anthem for the youth of WW1 and the lives of young soldiers today. Bursting onto stage in a Coat of Many Colours Joseph and the Amazing Technicolor Dreamcoat (Tuesdayday 18 to Saturday 22 November) returns to Darlington. This sparkling family musical has announced a new all-star cast; Danielle Hope winner of ITV’s Over the Rainbow competition, Lloyd Daniels X-Factor Finalist and Eastenders and Dancing on Ice Star Matt Lapinskas star in this ‘Amazing’, ‘Superb’, ‘Wonderful’ and ‘Brilliant’ production. Few musicals have received quite such acclaim as the multi award winning Blood Brothers (Monday 24 – Saturday 29 November). Written by Willy Russell, this legendary tale tells the captivating and moving tale of twins who, separated at birth, grow up on opposite sides of the tracks only to meet again with fateful consequences. The superb score includes Bright New Day, Marylin Monroe and the emotionally charged Tell Me It’s Not True. 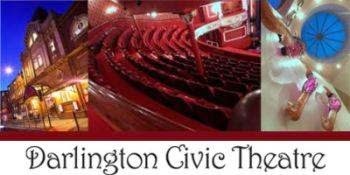 There’s no place like….Darlington Civic Theatre this Christmas! The Chuckle Brothers return to their favourite venue for The Chuckles of Oz (Saturday 6 December – Sunday 11 January), starring some familiar faces. Phil Corbitt returns as The Cowardly Lion, Danny Potts as The Tin Man, and our very own Beth Stobbart appears as Glinda the Good Witch alongside Adam Booth as The Scarecrow. 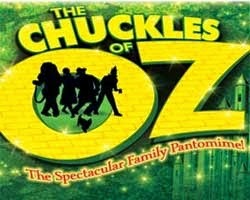 Packed with all of the traditional pantomime ingredients of comedy in abundance, stunning sets , beautiful costumes, plenty of boos and hissing and a yellow brick road into a world of suprises….The Chuckles of Oz offers a world of magic, mystery and mayhem! Tickets for the new Autumn Season are now on sale.